TechCrunch is hosting its first startup competition in Sub-Saharan Africa. 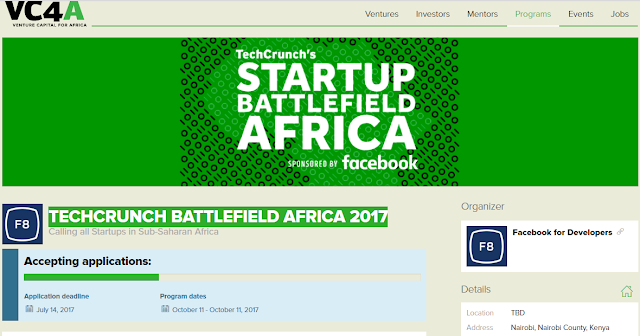 We’ve wanted to bring TechCrunch to Africa for a long time, and now thanks to our sponsor Facebook, we will bring the Startup Battlefield competition, to Nairobi on October 11 this year. We’re looking for Sub-Saharan Africa’s best innovators, makers and technical entrepreneurs to participate in TechCrunch Battlefield Africa 2017. Startups can apply to three categories: social good, productivity and utility, gaming and entertainment. TechCrunch will host the event in Nairobi in front of a live audience and top judges, and we will live stream the show on TechCrunch and Facebook so the rest of the world can tune in. The judges will choose a winner from each of the three categories: social good, productivity and utility, gaming the entertainment. One overall winner will be selected as “Sub-Saharan Africa’s Most Promising Startup.” The founders of the overall winner in each category will win $25,000 USD in no-equity cash, plus an all-expense paid trip for two to San Francisco to compete in the Battlefield at TechCrunch’s flagship event, Disrupt SF 2018. Startups must fit into one of three categories (social good, productivity and utility, gaming and entertainment) to participate. Five startups in each category will be selected to join us on stage for the Battlefield Africa in Nairobi. Productivity & Utility — The judges will pick startup with the product or service most likely to go into full commercial production and have the biggest impact on human potential and/or the largest exit. Gaming & Entertainment — The judges will pick startup with the product or service most likely to see wide consumer adoption and have either the biggest exit and/or impact on gaming and entertainment.